If your pages load slow, it is probably caused by uncompressed images. The problem is grave enough for Google to use page load time as a ranking factor now. 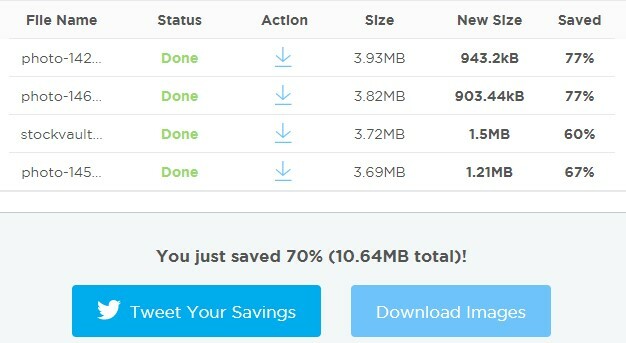 Optimizing your images properly lower your load time, reduce bounce rate, and save both your and customer’s data costs. So there is really no reason to upload an image to your website without optimizing it! JPEG is the most used image format on the world wide web. This is because it uses a lossy (irreversible) compression algorithm. However, most of the JPEG images you produced by digital cameras or download from the web are not compressed to the full extent. PNG is another image format that is widely used. Compared to JPEG, PNG uses a lossless (reversible) compression algorithm. This means it stores extra data to be able to reverse the image to its original quality. Such extra data, however, bloat the file size. Our PNG Compressor applies a lossy compression algorithm and removes extra metadata. The result is a drastically reduced PNG files size without losing image quality. Want to compress all your images at once? No problem. Simply drag and drop or select your images to our bulk image compressor and it will automatically start compressing them.